Christmas is right around the corner and if you’re anything like me, you’re hoping to hit a parlay Saturday night to avoid having to give out printed out Instagram selfies as Christmas presents. 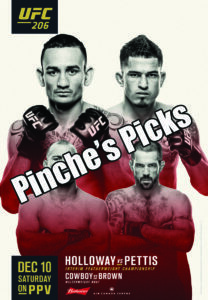 I took a detailed look into the entire UFC 206 fight card with a microscope and fine-tooth comb for the past 72 hours straight, to come up with these picks which I can guarantee will win you money; or not, you never know with fights. I was off on the last card and I did even more research for that one. Plus, I’m getting older and the days are shorter, I sleep a lot more and my feet are always cold. Anyways, here’s my picks for UFC 206. Emil Meek is coming off of an impressive 45 second KO victory over Rousimar Palhares heading into his UFC debut against the formerly retired Jordan Mein. Mein last fought Thiago Alves in January of 2015 where he was stopped by a body kick in the second round. Shortly after, Mein announced his retirement from MMA but had a change of heart when the UFC decided to make a trip into his home turf. Meek is 8-2 with 7 TKO victories, and is on a 3-fight winning streak heading into this matchup, but it will be Mein’s striking that puts an end to that streak. Meek likes to come out wild and brawl with his opponents, as long as Mein can avoid this, his superior striking will put Meek down. Mein gets the win here. Kelvin Gastelum is making his second appearance in the middleweight division, after again, failing to make weight. He was supposed to face Donald Cerrone in a welterweight fight in New York City, but after realizing he wasn’t going to come close to 170lb, he decided to not show up to weigh-ins. The fight was scrapped and Dana White decided he would “never” fight as a welterweight again, which would put Gastelum in a weight class he doesn’t have enough size. Gastelum has shown to be a talented fighter but lacks the discipline to take his career to the next level. Tim Kennedy, on the other hand, is probably the most disciplined guy in the UFC. Although he hasn’t stepped into the cage since his TKO loss to Yoel Romero in 2014, I guarantee Kennedy will come in more prepared for this fight than Gastelum will. Kennedy will have a size and strength advantage, and it will show Saturday night. He controls the fight wherever it goes and gets the win for all his new MMAAA friends. “The Korean Superboy” Dooho Choi is riding a 13-fight winning streak with his last 8 fights ending by TKO. Since coming to the UFC, Choi has finished Puig, Sicilia, and most recently Thiago Tavares. After the Tavares fight, Choi asked for Swanson and the UFC gave him an early Christmas present. Swanson is bouncing back from a 2-fight losing skid and is looking to put a stop to the hype train Choi is riding. Swanson will definitely be on a different level of striking than any of Choi’s previous opponents and has only been knocked out once in his career, but that won’t be enough to get the win against Choi. These two fighters are equally talented but they are on different ends of their careers. It will not be easy to finish Swanson, but Choi will get it done Saturday night. Donald Cerrone was ready to fight at UFC 205, but after his fight was scrapped he was left looking for an opponent. Matt Brown, who has never been known to shy away from a fight, stepped in to be Cerrone’s Huckleberry and he looks pumped for this one. Although Cerrone was prepared for a fight a few weeks ago, I’m sure he’s had a fair share of Budweisers since then. He also almost lost an eyeball, got a huge “BMF” tattoo across his neck, and accidentally became a board member for the new MMAAA fighter’s union; that won’t matter for this fight. Brown is 1-4 in his last 5 and has lost his last 2 fights. He just isn’t the same. I agree with Brown that Cerrone doesn’t like to get beat up, I just don’t think Brown can beat Cerrone up. Cerrone will weather the storm during the first round and then dominate Brown through the second and third. Cerrone easily gets the win here. This newly announced “championship” fight for the featherweight “interim championship” came out of nowhere. It’s almost as if the UFC panicked when the original main event, Cormier vs Johnson, was scrapped and made up a belt so there was still a title fight Saturday night. Either way, the winner of this fight for the “interim championship” will face new featherweight “champion” Jose Aldo, who was promoted from “interim champion” to “champion” after the UFC “stripped” the title away from Conor McGregor. Pettis is coming off of a win over Charles Oliveira after dropping down to the featherweight division following a 3-fight losing streak at 155lb. Holloway, on the other hand, is on a 9-fight winning streak and has really hit his stride lately. There are only a couple guys at 145lb that could beat Holloway right now, and one of them is the new “champion”. Holloway walks through Pettis then meets Aldo to unify the “interim championship” and “championship” belts. UPDATE: Pettis missed weight by 3lb. If Holloway wins, he will win the interim title, and if Pettis wins, he does not.